We find Zomergem mentioned for the first time in the 9th Century. It was then called Sumaringahem which meant the place where Sumar(i)os or Sumar's people live. Sumar comes from sumaro which means "very big". The "ing" suffix means clan or group of. And "hem" or "heem" means a dwelling. People lived here in the Bronze Age. Traces of what remains of hills covering graves were found in the districts of Zomergem-Boven (Upper Zomergem) and Schuttershoek (Shooters Corner). There was also human activity in Roman times, in the 2nd and 3rd Centuries AD. During the feudal era Zomergem was a Corporation, a juridical entity within the Chancellery. The Zomergem Corporation came under the Oudburg (Old Fortress) of Ghent and comprised Zomergem, parts of Waarschoot, Oostwinkel and Ronsele. But there were also plenty of enclaves belonging to other Seigneuries. The heart of the Zomergem Seigneury was originally a farm, "the estate of Schipdonk" held in feudal tenure for the viscountcies of Ghent and Heusden. It is still there, now near the Schipdonk Canal. The first mention of a lord of Zomergem concerned a certain Herman van Somergem who left in 1085 with Robrecht the Friesian to take part in one of the Crusades. The family gave generously to the deanery of Papinglo at Kleit. Zomergem came under the house of Massemen in the 14th Century. In the 15th Century Filip van Massemen left instructions in his last will and testament for the foundation of a hospital at Zomergem. He gave for this purpose two farms of altogether approximately 5 acres. The lord of Zomergem had a lot of authority but not that of chief justice. This office was reserved for the representative of the duke, the head reeve of the deanery. Many lords instituted legal proceedings against the count especially concerning their judicial rights. This was the case in 1235 of Boudewijn (Baldwin) de Pratis, lord of Zomergem, in 1420 of Boudewijn de Vos and in 1562 of Martin Snouckaert. The latter finally succeeded in gaining the office of supreme justice. Several Snouckaert generations produced a 'lord of Zomergem'. Louise-Marie, princess of Montmorency, was 'lady of Zomergem' at the end of the Ancien Régime. The town centre is situated about 22 meters above sea level. It's only natural it should develop and expand on such a hill. But the highest point is to the west: 28 meters abe the sea between Bouwerwaan and Rijvers. This was in the old days also the most wooded area of Zomergem. What little remains of these woods can be seen near the Keigat (place full of cobble-stones). Plenty of cobble-stones could also be found on the Ronselse Steenberg (Stone mountain). And to the east of these "mountains" stretches the Flemish Valley. What was once marshland, 5 to 7 meters above sea level, was transformed into fertile land. This was realized by the impressive farmsteads such as the Rapenburg and Meirlare estates. Roads go from the town centre to Adegem, Waarschoot, Ghent and Merendree. The "Oude Bruggeweg" (Old Bruges Road) was well traveled. It led through the Drongen Estate to come upon the Gentweg (Ghent Road) which passes through Knesselare and Ursel. Plenty of evidence suggests the first centre of Zomergem was on what is now called Upper Zomergem (Zomergem-Boven), a few hundred meters south of today's market place. Plenty of names from before 1600, e.g. names of inns confirm this idea. To the south of the church we find the Maarten Steyaert Square. This is no doubt the old market square. There is a monumental water pump and a bust of "Primus Steyaert". Maarten "Primus" Steyaert (1647 - 1701) was always first of his class at the University of Leuven. He was a theologian, who went on to become deacon of the St Peters Church of Leuven and vicar of the bishopric of 's Hertogenbosch. Karel Lodewijk Ledeganck was a justice of the peace at Zomergem from 1836 to 1842. He lived in a house in the Kerkstraat (Church Road) and here he wrote his poetical work "Het Burgslot van Zomergem" (The Manor House of Zomergem). He was one of Meetjesland's most famous poets. In 1848 Zomergem went through a great famine. Many inhabitants were close to death by starvation. The situation was so bad that, according to the diary of Burgomaster Bernard De Neve, on a particular day as many as 11 persons were buried. A poor family of the Durmen district was in such a bad way they resorted to eating weeds that grow in the area. Their 10 year old son, called Jan Francies Wille (1838-1923) was found starving, propped up against a tree by the side of the road. The lady of Durmen Castle was informed of the terrible state they were in and the noble lady made sure the lad and his family were fed. They were also allowed to come to the castle once a week for a loaf of rye bread. This tale was told over and over up to this day. We were told it by Mrs. Van Laecke, the widow of Mr. R. Bockaert and we thank her for it. It might be useful to compare those times with our current situation. The defense line formed by the Schipdonk Canal meant Zomergem was in the firing line in both World Wars. The church was very badly damaged in October 1918 and the work to repair it lasted until 1924. 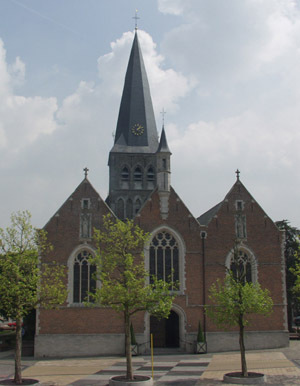 And from 14 to 26 May 1940 the church was again bombarded. Zomergem has one of the most beautiful town halls of our Meetjesland. 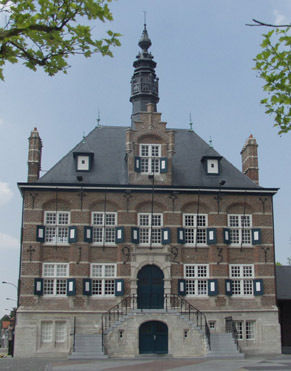 It was built in 1923 by Valentine Vaerwijck in the Flemish Neo-Renaissance style. The market place was built in the same year. The previous town hall dated from 1870. It had bas-reliefs by Karel De Kesel but these was destroyed in WW I. 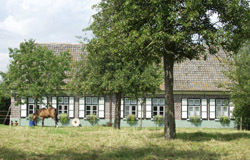 Historians believe the Rapenburg Farm was founded in the 13th Century when the region was first developped. From the start the "Rapenburg Estate" would have been a freehold under the Oudburg (Old Fortress) of Ghent. It has nearly always been the property of one or the other wealthy patrician family from Ghent. A lease of 1412 first tells us a little about the estate. The owner then was the van Raveschoot family. Via the Alegambes Rapenburg came in 1708 in the hands of the de Draeck family. Later, thanks to a marriage, the van Rode family was owner of the estate until 1907. The doors and windows are painted red and white, the colours of the noble d'Ursel de Bousies family, the owners of the property since 1960. Part of the moat is still there. That moat once upon a time surrounded the entire farm. And for more than 100 years now, in fact since 5 February 1905, the Verschelde family calls this their home. With Nic Verschelde who succeeded his father Etienne this is now the fourth generation. We congratulate them for maintaining this historic place so beautifully. Zomergem itself now has about 6900 inhabitants. Without asking the consent of the people concerned the towns of Oostwinkel (725 inhabitants) and Ronsele (580 inhabitants) were merged into what I call here greater Zomergem. Source for most of the above: "Streekgids Meetjesland", pp. 88-92 by Walter Notteboom. For those of you who read Dutch here is the original article quoted above, written by R. Claeys as it appeared in "Ons Meetjesland", 1978, 1, p. 27.